In today’s ever-changing world of college basketball recruiting, you have to move pretty fast to keep up. Information that was fresh just a few hours ago can become outdated so fast, that it is like that information was several years old. This has been the case for several Ohio prospects in the last couple of days, as more players have received offers, while some of the top players have received additional offers. Adding on to where we left off a couple of days ago, here are some of the latest rumblings that we’ve heard from around the Buckeye State…. 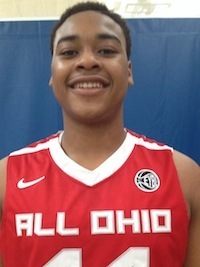 • Nick Ward – ’16 Gahanna Lincoln C: Very few class of 2016 big men from anywhere in the Midwest had better a better July than Ward, who was often dominant for his All-Ohio Red team, especially in the final period in Louisville for the AAU Super Showcase. Not so coincidentally, college coaches have been blowing up Ward’s phone lines to offer him scholarships. This past week, the Columbus area rising junior post added offers from Iowa, Miami (FL) and Xavier, giving him three more high major schools to add to his list. Ward now has eight high major offers, to our knowledge, and is gaining interest from at least that many other similar programs. • Noah Bramlage – ’15 Ottawa Glandorf PF: Bramlage added another offer this week, this time from MAC power Akron. The Zips were previously one of the only schools from the MAC to have not extended an offer Bramlage’s way, but head coach Keith Dambrot remedied that on Thursday night when he called on the 6’7 power forward. Bramlage now has over fifteen D1 offers, including Wright State, Miami (OH), Ohio University, Lehigh and Harvard. The power forward talked to TDP on Thursday night, and said that he is in the process of shortening his list and determining which schools he will take official visits to. • Esa Ahmad – ’15 Cleveland Shaker Heights PF: One of the top available prospects in the entire Midwest, Ahmad has likely had his phone ring as much as anyone in the region over the last few days. While many programs are vying hard for his services, two programs have to like their chances a little more than before, as they’ve secured unofficial visits from the Cleveland area rising senior. Ahmad will unofficially visit both Ohio State and Cincinnati over the weekend, as the power forward tours the central and southern parts of his home-state. Like many others in his class, Ahmad is working on trimming his list and setting up visits from an offer sheet that includes schools like Wisconsin, Indiana, West Virginia, Maryland and more. • The Kent State Golden Flashes have been particularly active in offering in-state prospects this summer, and head coach Rob Senderoff shows no signs of slowing down heading into August, after offering two in-state class of 2016 prospects in the last two days of July. Both Micah Potter, of Mentor, and Johnstown Monroe’s Jason Carter received offers from Kent State this week, with Senderoff prioritizing frontcourt talent in the class of 2016. The Cleveland area post, Potter, was a player who really blew up in July as he earned several mid-major offers, while Carter only received his first offer this week, with Kent State becoming the second school to offer him a scholarship. Potter also received an additional offer this week, as MAC rival Buffalo joined Kent State on the post player’s list. • There is always a value placed on kids who can shoot the basketball, and that is exactly what is spear-heading the recruitments of class of 2015 combo guards Jaevin Cumberland and Elijah Pughsley. After three July events were both guards shot the lights out from the three-point line, both players are earning scholarship offers at a furious rate. Cumberland, a 6’0 guard out of Wilmington who played AAU with the King James Runnin’ Rebels, picked up offers from The Citadel and Northern Kentucky in the last two days, giving him a total of six D1 offers, as well as interest from Ohio University, Akron and Wright State. On the other side, Pughsley, formerly of Cincinnati Hughes but now enrolled back home at Lima Senior, received an offers from North Carolina Central and Maine. Those two offers mark the third and fourth D1 offers for Pughsley, who spent the AAU season with the Queen City Prophets. • Brian Parker – ’15 Cleveland Villa Angela-St. Joe’s SG: One of Ohio’s toughest competitors and strongest guards, Parker finished off his AAU season in style with PK Flash out of Pennsylvania, as the 6’2 wing guard added a pair of D1 offers. Both Saint Francis (PA) and Loyola (MD) extended offers to the former state champion, who will be attempting to take Cleveland VASJ to a third straight Final Four this coming winter.